There are many types of anti slip tapes on the market: everything from ribbed rubber anti slip tape to anti slip water proof tape. 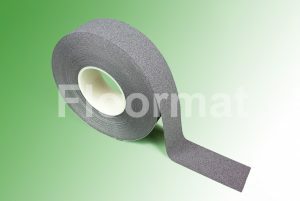 One popular variety of anti slip tape that homeowners cannot seem to stop buying is cushion grip tape. Cushion grip tape is a little different from other varieties of anti slip tape, in that it has a soft surface that makes it safe and comfortable for bare feet. This being the case, it has a variety of uses throughout the home. This article will highlight some of those uses. If you have little kids running around your house, safety should always be your top priority. Parents invest in many products to ensure the safety of their children: everything from gates, to car seats, to outlet covers. Maintaining a safe home for your children (and children who happen to be visiting) means doing whatever you can to prevent slip and fall injuries. Slips and falls can be very harmful for children (and adults), as they can cause permanent injuries and even death. Even if the injury is not permanent, a broken leg or sprained ankle is never fun to deal with. For this reason, it is important that parents do everything in their power to prevent these injuries from occurring. Putting down Floormat anti slip tape is one of the measures you can take to protect your children in this regard. Putting cushion grip tape down on hard, slippery surfaces like hardwood or tile is recommended for when kids are running around in those areas. The grip itself is non-abrasive, and like some other grip tapes on the market, will not irritate bare feet. This tape is actually pretty comfortable to walk on—you might actually mistake it for carpet! Another great use for cushioned grip tape is truck beds. If you drive a pickup truck, you know whatever you are hauling in the back of the truck tends to slide around, which can cause scratches, dents, and other damage. When you put cushion grip tape down, however, you can help prevent the objects in your truck from sliding all over the place. What’s more, because this grip tape is non-abrasive, the materials you are hauling will not be damaged by the tape itself. Not only does cushion grip tape protect your feet, and your products, it can protect your hands as well. It can make it easier for you to grip things, while also providing a cushion for your hands. For this reason, it pays to get creative with cushion grip tape. If you play baseball, try wrapping it around the bat handle. This tape also works great when wrapped around tennis rackets. If you are an avid biker, try wrapping this tape around your handlebars. Using cushion grip tape in this way will make the hobbies you love more comfortable and more enjoyable.